Complete- includes both Part 1 and Part 2. Part 1 is presented with 35 full-color 19th century illustrations. Both Parts 1 and 2 are annotated with the full text of Bunyan's Scripture references. John Bunyan's dream, written from a prison cell, has become the most famous allegory in English literature. in family worship- and still it is read by all those who, too, would be a pilgrim. John Bunyan wrote "The Pilgrim's Progress" during six months of incarceration. Bunyan's "The Pilgrim's Progress" published. Bunyan's second edition of "The Pilgrim's Progress" published in the autumn. Bunyan's eighth edition of "The Pilgrim's Progress" published with additional last improvements. Bunyan's ninth edition of "The Pilgrim's Progress" published. 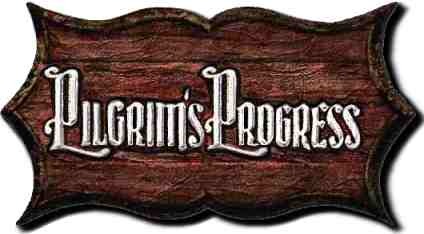 John Bunyan published Part Two of "The Pilgrim's Progress". Bunyan published tenth edition of "The Pilgrim's Progress". *Note: At the website "Acacia John Bunyan", see A Timeline Chronicling the Life of John Bunyan ---New Window for more about the events of John Bunyan's life. OME time since, to tell you my dream that I had of CHRISTIAN the pilgrim, and of his dangerous journey towards the Celestial Country, was pleasant to me, and profitable to you. I told you then also what I saw concerning his wife and children, and how unwilling they were to go with him on pilgrimage: insomuch that he was forced to go on his progress without them; for he durst not run the danger of that destruction which he feared would come by staying with them in the city of Destruction: wherefore, as I then showed you, he left them and departed. Sagacity. Then said Mr. SAGACITY--for that was his name: "It is the city of Destruction; a populous place, but possessed with a very ill conditioned and idle sort of people." his CHRISTIANA (for that was her name from the day that she, with her children, betook themselves to a pilgrim's life), after her husband was gone over the river, and she could hear of him no more, her thoughts began to work in her mind: first, for that she had lost her husband, and for that the loving bond of that relation was utterly broken betwixt them; for you know," said he to me, "nature can do no less but entertain the living with many a heavy cogitation in the remembrance of the loss of loving relations. This, therefore, of her husband did cost her many a tear. But this was not all; for CHRISTIANA did also begin to consider with herself, whether her unbecoming behaviour towards her husband was not one cause that she saw him no more, and that in such sort he was taken away from her. And upon this came into her mind by swarms all her unkind, unnatural, and ungodly carriages to her dear friend, which also clogged her conscience, and did load her with guilt. She was, moreover, much broken with calling to remembrance the restless groans, brinish tears, and self-bemoanings of her husband; and how she did harden her heart against all his entreaties and loving persuasions (of her and her sons) to go with him; yea, there was not anything that CHRISTIAN either said to her, or did before her, all the while that his burden did hang on his back, but it returned upon her like a flash of lightning, and rent the caul of her heart in two. Specially, that bitter outcry of his, 'What must I do to be saved?' did ring in her ears most dolefully. "Then said the visitor, 'CHRISTIANA! the bitter is before the sweet. Thou must through troubles, as did he that went before thee, enter this Celestial City. Wherefore I advise thee to do as did CHRISTIAN thy husband: go to the wicket gate yonder, over the plain, for that stands in the head of the way up which thou must go; and I wish thee all good speed. Also I advise that thou put this letter in thy bosom. That thou read therein to thyself and to thy children, until you have got it by heart. For it is one of the songs that thou must sing while thou art in this house of thy pilgrimage. ut while they were thus about to be gone, two of the women that were CHRISTIANA'S neighbours came up to her house, and knocked at her door. To whom she said, as before, 'If you come in God's name, come in.' At this the women were stunned; for this kind of language they used not to hear, or to perceive to drop from the lips of CHRISTIANA. Yet they came in; but behold, they found the good woman preparing to be gone from her house. "Tim.Aye, go she will, whatever come on't; and methinks I know it by this, for that which was my great argument to persuade her to stay at home (to wit, the troubles she was like to meet with in the way), is one great argument with her to put her forward on her journey. For she told me in so many words, the bitter goes before the sweet. Yea, and for as much as it so doth, it makes the sweet the sweeter. nd now Mr. SAGACITY left me to dream out my dream by myself. Wherefore methought I saw CHRISTIANA, and MERCY, and the boys, go all of them up to the gate. To which when they were come, they betook themselves to a short debate about how they must manage their calling at the gate, and what should be said to him that did open to them. So it was concluded, since CHRISTIANA was the eldest, that she should knock for entrance; and that she should speak to him that did open for the rest. So CHRISTIANA began to knock; and as her poor husband did, she knocked and knocked again. But instead of any that answered, they all thought that they heard as if a dog came barking upon them. A dog, and a great one too; and this made the women and children afraid. Nor durst they for awhile to knock any more, for fear the mastiff should fly upon them. Now, therefore, they were greatly tumbled up and down in their minds, and knew not what to do. Knock they durst not, for fear of the dog; go back they durst not, for fear that the keeper of that gate should espy them as they so went, and should be offended with them. At last they thought of knocking again, and knocked more vehemently than they did at the first. Then said the keeper of the gate, "Who is there?" So the dog left off to bark, and he opened unto them. PART I. or STAGE 2.